Artist's concept of NASA's New Horizons probe flying through the Pluto system. New Horizons team members are asking for the public's help in naming features on Pluto and its largest moon, Charon. You can help put names on the Pluto maps that scientists will draw up after the first-ever flyby of the dwarf planet this summer. 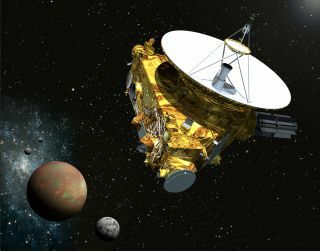 Researchers working on NASA's New Horizons mission, which will zoom through the Pluto system on July 14, are asking the public to propose and vote on names for geological features the probe will identify on Pluto and its largest moon, Charon. "Pluto belongs to everyone," New Horizon science team member Mark Showalter, of the SETI (Search for Extraterrestrial Intelligence) Institute in Mountain View, California, said in a statement. "So we want everyone to be involved in making the map of this distant world." The SETI Institute is leading the "Our Pluto" naming campaign. The public can suggest and vote on monikers at http://ourpluto.seti.org through April 7; New Horizons team members will then go through the results and submit a batch of recommendations to the International Astronomical Union (IAU), which assigns "official" names to celestial objects and their features. The IAU, of course, came up with a new definition of "planet" in 2006 that resulted in Pluto being reclassified as a dwarf planet. The decision remains controversial to this day. Many names will doubtless be required after New Horizons' highly anticipated flyby. Pluto images captured by NASA's Hubble Space Telescope, while fuzzy, show extensive bright and dark areas, suggesting that the frigid,1,400-mile-wide (2,300 kilometers) object has a complex and varied surface. But the current naming campaign should be much more involved than that previous one, researchers said. "The difference is that last time we only needed two names, whereas now we could need more than a hundred," Showalter said. "We are eager to gather recommendations from people all over the world."